Daltile's San Michele glazed porcelain tile realistically portrays vein-cut and cross-cut travertine natural stone through sophisticated graphics. Offered in warm color tones San Michele is a great addition to any space. San Michele mosaic tile works perfectly as either an accent or a total installation. 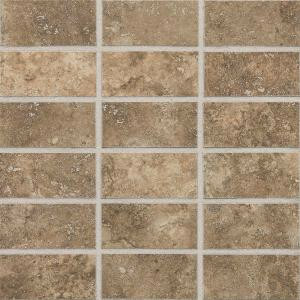 Buy online Daltile San Michele Moka Cross-Cut 12 in. x 12 in. x 8 mm Glazed Porcelain Mosaic Floor and Wall Tile SI3224MSS1P2, leave review and share Your friends.